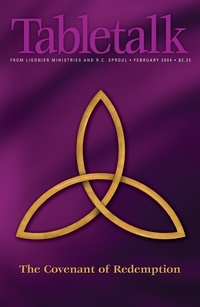 The February 2004 issue of Tabletalk looks at the covenant of redemption. Contributors include R.C. Sproul along with Mike Chastain, George Grant, Dennis Johnson, Don Kistler, and R.C. Sproul Jr. Tabletalk features articles about topics central to the Christian faith and daily, in-depth Bible studies.